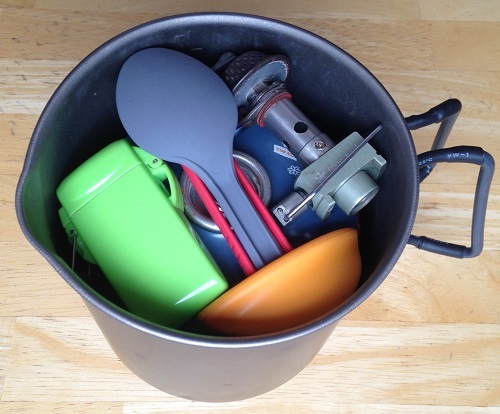 Need a pot for 1 person that can easily hold your fuel canister, stove, utensils, and lighter? 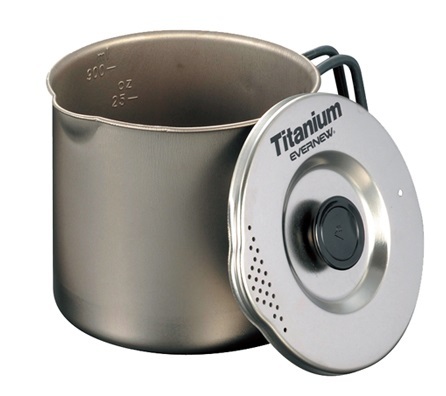 Look no further than the Evernew Titanium Ultralight Medium Pasta Pot (also called the ECA522 on Evernew’s website). This is an excellent solo pot. What really makes this pot stand out, other than its ridiculously light weight (4.1 oz. and a 1000 ml. capacity), is how it is perfectly sized to contain your entire lightweight cook set. When you switch your packing focus to be lightweight and streamlined it is always a challenge to not only drop weight but to also maximize how you pack your pack. The more streamlined you are the smaller a pack you can use and a smaller pack is a lighter pack. Cooking in the Evernew Titanium Ultralight Pasta Pot is very easy. It has a 1000 ml capacity which I think is perfect as solo pot. Freeze dried meals have become the go to dinner for most people in the backcountry lately. Personally it kind of weirds me out to poor boiling water into a plastic bag, let it sit for a while (as whatever is in the plastic leaches out into your food) and then eat. I like to boil the water in my pot and pour the freeze dried dinner out of the bag and into my pot to hydrate. I’ve also found that if I pour the meal into the pot and keep it on the heat for another 30-60 seconds while I mix it up I never am left with slightly crunchy chunks of beef in my beef stew (or whatever else I’m re-hydrating). The 1000 ml. capacity is enough volume to hold the 16 oz of water your freeze dried dinner needs along with the entire dinner while still having enough “extra” room in the pot to give it a good stir without worrying about spilling. My summertime cook kit. Everything (including an 8 oz. fuel canister) fits nicely into my Evernew Titanium Ultralight Pasta Pot M.
When I’m hiking in the summertime rarely do I bring a mug along with my cook pot. Spring, Fall and Winter I really enjoy a nice hot cup of coffee in the morning or coco before bed but in the Summer its just too warm outside. If I do end up making a hot drink I, in the summer, also don’t care as much if my drink stays piping hot so I don’t need some sort of insulated or double walled mug. Instead I bring just the Evernew Titanium Ultralight Pasta Pot and a set of Snow Peak HotLips. This pot is big enough to cook in but not so big it becomes uncomfortable to use as a mug. One thing I don’t like about this pot is the lid. There are two things I dislike. First, the lid is made to be able to strain pasta (the reason its called the pasta pot) through the holes in the lid’s poor spout. The problem is that the lid wraps around the top of the pot rather than being set into the pot. This causes the water to, rather than flow out the holes in the lid made for straining things, want to flow under the lid and down the side of the pot. It still works to strain pasta but you really need to be careful – I’ve come close to burning myself with hot water a few times due to the erratic way water comes out of this pot as you try and strain things. This is somewhat a minor complaint as I rarely find myself straining pasta in the woods. The second (and more meaningful) complaint I have with this pot’s lid is the small plastic handle you are expected to use to remove the hot lid after you have boiled your water. Because this lid is made to wrap around the lip of the pot, rather than being set into the pot, the lid can become slightly stuck from time to time requiring you to use a slight bit of force to remove it. The problem is that the handle is way too small for you to be able to get a good grip. Its fine when the lid comes off easially but really getting a grip on it always causes me to accidently touch the tips of my fingers to the piping hot lid and burn myself. The solution I came up with was to apply Surgu (an air curing rubber that has the consistency of silly putty when it comes out of the package but then dries hard after several hours) to the top of the lid to insulate where my finger tips accidently touch and get burned. While this solution works I feel like I shouldn’t have had to come up with something like this. Evernew really should have done more R&D on this product – both of these complaints seem like things that should have been easily discovered and fixed during any type of real world testing. 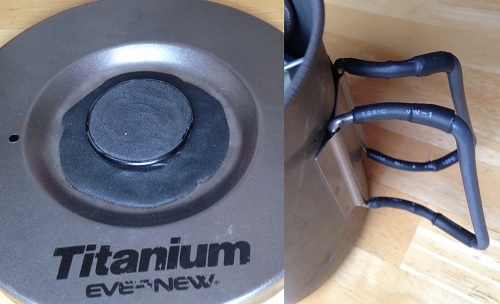 The extra insulation I’ve added to my Evernew Titanium Pasta Pot M. On the left you can see the Surgu I’ve placed on the lid and on the right you can see some extra heat shrink tubing I’ve use to extend the rubber handle insulation. Even with my complaints the Evernew Titanium Ultralight Pasta Pot M is still my go to solo cooking pot when I head out into the backcountry alone. This entry was posted in Activities, Activities, Backpacking, Gear, Camp Kitchen, Cookware, Brands, Evernew, Product Review.